Wir wissen mehr über den Mond, als über die Ozeane, so hört man manchmal. Doch unbemerkt von der Öffentlichkeit füllt eine riesige Flotte von Tausenden von Mini-U-Booten diese Datenlücke. Argo heisst das Projekt, und es feiert gerade den 15-Geburtstag. Ein interessanter Beitrag, der in der Sendung bei Minute 13:35 beginnt und hier online nachzuhören ist. Einziger Kritikpunkt: Im Beitrag wird so ganz lässig nebenbei die ziemlich gewagte These aufgestellt, das ARGO System hätte eindeutig bewiesen, dass die fehlende Wärme aus dem Temperatur-Hiatus gänzlich im Meer verschwunden wäre, das Rätsel somit endgültig gelöst wäre. Das ist natürlich murks und ein Schlag ins Gesicht all jener Klimaforscher, die noch immer auf der Suche nach einer guten Erklärung für den Hiatus sind. Siehe z.B. “Michael Mann, Ben Santer, Gerald Meehl: Erwärmungshiatus existiert und ist erklärungsbedürftig. Klimamodelle müssen auf den Prüfstand“. Aber wir nehmen den SRF-Beitrag gerne zum Anlass, uns in Punkto Ozeanwärme auf den neuesten Stand zu bringen. Das haben wir letztmalig im August 2014 getan, als wir in der Tiefe des Ozeans eine gänzlich andere Geschichte entdeckten (siehe “Suche nach der angeblich im Ozean versunkenen Wärme endet mit Fehlschlag: Tiefe Meeresschichten kühlten sich in den letzten 20 Jahren ab“). Der Beitrag wurde auch auf The Hockeystick in englischer Sprache veröffentlicht. Etwa die Hälfte der zusätzlichen Wärme nahmen die Weltmeere in den vergangenen 20 Jahren auf [...] Doch heizten sich die Weltmeere besonders in den vergangenen beiden Jahrzehnten besonders schnell auf. Über dieses Ergebnis, das für zukünftige Klimamodelle von großer Bedeutung ist, berichten nun amerikanische Wissenschaftler in der Fachzeitschrift „Nature Climate Change“. „In jüngster Zeit haben sich die Ozeane substanziell erwärmt und das Wärmesignal reicht in immer tiefere Wasserschichten“, sagt Peter Gleckler vom Lawrance Livermore National Laboratory. Ganzen Artikel auf Wissenschaft Aktuell lesen. Aber weiß man das so genau, wenn das ARGO-Messnetz erst 15 Jahre alt ist? Und wie sieht es unterhalb von 700m aus? Kann die anhaltende Erwärmung der oberen 700m den Hiatus erklären? Wir begeben uns auf Spurensuche. Im August 2014 erschien im Journal of Physical Oceanography ein Paper von Carl Wunsch und Patrick Heimbach, das den ozeanischen Wärmeinhalt der letzten zwei Jahrzehnte beschrieb. A dynamically consistent state estimate is used for the period 1992–2011 to describe the changes in oceanic temperatures and heat content, with an emphasis on determining the noise background in the abyssal (below 2000 m) depths. Interpretation requires close attention to the long memory of the deep ocean, implying that meteorological forcing of decades to thousands of years ago should still be producing trendlike changes in abyssal heat content. Much of the deep-ocean volume remained unobserved. At the present time, warming is seen in the deep western Atlantic and Southern Oceans, roughly consistent with those regions of the ocean expected to display the earliest responses to surface disturbances. Parts of the deeper ocean, below 3600 m, show cooling. Most of the variation in the abyssal Pacific Ocean is comparatively featureless, consistent with the slow, diffusive approach to a steady state expected there. In the global average, changes in heat content below 2000 m are roughly 10% of those inferred for the upper ocean over the 20-yr period. A useful global observing strategy for detecting future change has to be designed to account for the different time and spatial scales manifested in the observed changes. If the precision estimates of heat content change are independent of systematic errors, determining oceanic heat uptake values equivalent to 0.1 W m−2 is possibly attainable over future bidecadal periods. Direct determination of changes in oceanic heat content over the last 20 years are not in conflict with estimates of the radiative forcing, but the uncertainties remain too large to rationalize e.g., the apparent “pause” in warming. The implication of this is that a build up of heat in the deep oceans is not the solution to the so called missing energy mystery that has puzzled climate scientists trying to match the observed heat build up on the planet with what the theory of global warming suggests should be happening. A number of climate scientists had previously suggested that heat is accumulating in the deep oceans and that this accounts for the missing energy. An analysis of ocean data together with satellite measurements suggests that the warming rate for the top 700m of ocean in the southern hemisphere has been underestimated – at least from 1970 until the early 2000s when an array of measurement buoys, known as Argo, began to collect data. Separately, an analysis of satellite measurements and ocean temperature data has revealed that that the deeper half of the ocean (below 2 km depth) has, on average, not warmed from 2005 to 2013 and may have cooled – in contrast to the prevailing view, based on sparse ship-based measurements, that had suggested deep ocean warming between the 1990s and 2005. Papers relating to both pieces of research have been published in Nature Climate Change. Both papers are important because they shed light on the debate around the so called missing energy mystery. Essentially, they imply that heat has accumulated faster than had been thought in the upper ocean but not, as many have suggested, in the deeper ocean below 2km. To arrive at their conclusion, the JPL scientists did a straightforward subtraction calculation, using data for 2005-2013 from the Argo buoys, NASA’s Jason-1 and Jason-2 satellites, and the agency’s Gravity Recovery and Climate Experiment (GRACE) satellites. From the total amount of sea level rise, they subtracted the amount of rise from the expansion in the upper ocean, and the amount of rise that came from added meltwater. The remainder represented the amount of sea level rise caused by warming in the deep ocean. The remainder was essentially zero. 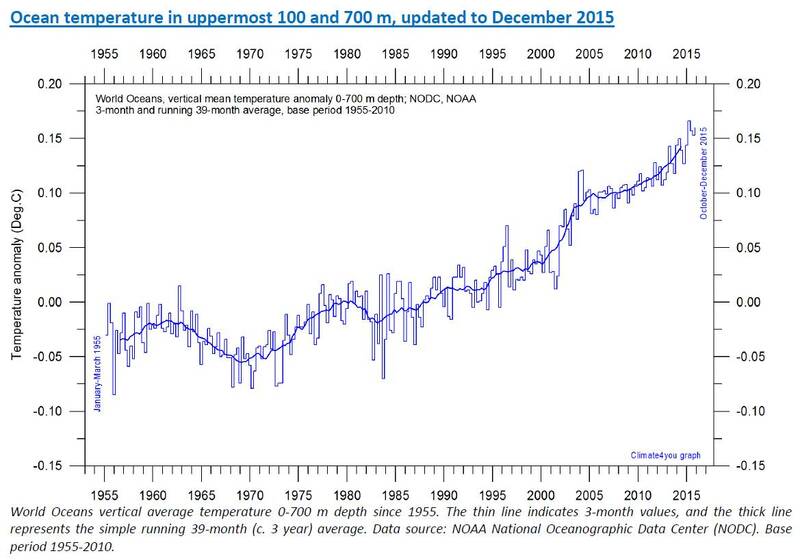 Deep ocean warming contributed virtually nothing to sea level rise during this period. Estimated values of recent oceanic heat uptake are on the order of a few tenths of a W m−2, and are a very small residual of air–sea exchanges, with annual average regional magnitudes of hundreds of W m−2. Using a dynamically consistent state estimate, the redistribution of heat within the ocean is calculated over a 20-yr period. The 20-yr mean vertical heat flux shows strong variations in both the lateral and vertical directions, consistent with the ocean being a dynamically active and spatially complex heat exchanger. Between mixing and advection, the two processes determining the vertical heat transport in the deep ocean, advection plays a more important role in setting the spatial patterns of vertical heat exchange and its temporal variations. The global integral of vertical heat flux shows an upward heat transport in the deep ocean, suggesting a cooling trend in the deep ocean. These results support an inference that the near-surface thermal properties of the ocean are a consequence, at least in part, of internal redistributions of heat, some of which must reflect water that has undergone long trajectories since last exposure to the atmosphere. The small residual heat exchange with the atmosphere today is unlikely to represent the interaction with an ocean that was in thermal equilibrium at the start of global warming. An analogy is drawn with carbon-14 “reservoir ages,” which range from over hundreds to a thousand years.